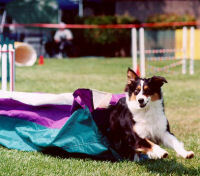 We started at USAgility in January 1999. I must admit that it was through Sandy Crook and her training that Nala and I have achieved such great success. Sandy's weekly courses are challenging. Sandy also instills a "you can do it" attitude! NADAC NATIONALS 2001— earned 3rd place in the 24" division at the NADAC nationals in Mankato, MN. 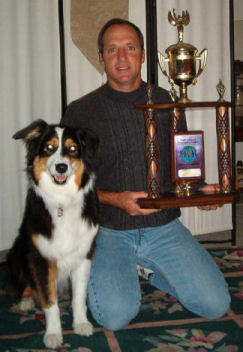 She also recently received the merit award of "#1 Agility Dog" from ASCA for 1999. NADAC NATIONALS 2002 Update! "Nala is the NADAC Grand Champion 2002 in the 20+ class. Nala and I completed at the NADAC National in Mandato, Minnesota September 26-28, 2002. Nala was both accurate enough and fast enough to beat some pretty awesome dogs — I'm so proud of her! 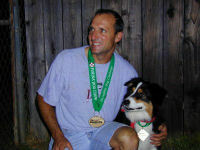 Thanks to you and everyone associated with our agility quest." 2004 Updates! 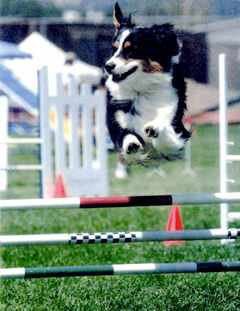 -- To Sandy Crook at US Agility: Thanks for all the great instruction. You provided a solid foundation for us to be a successful agility team. Your words ring true every step of the way. Nala most recently earned a MACH title - this is a milestone that we could not have achieved without you.